President of the Empire Broadcasting Corp.
July 7, 2016 - The following is an interview with Joe Reilly, former President of the New York State Broadcasters Association and President of Empire Broadcasting Corp. in Malta, NY, conducted by American Sportscasters Association President Lou Schwartz. Lou Schwartz: When did you start your broadcasting career? LS: What happened after that? JR: After Annapolis I moved to New Jersey where I was on the radio there for a few years. Then I put my own station on the air in Albany, NY, my hometown. I sold that and in 1980 I was named the President of the New York State Broadcasters Association and I was President for 31 years. LS: I believe I first became acquainted with you when I was the owner of WGVA in Geneva, NY. JR: Yes. We were having a conference down in White Plains and the speakers were New York Governor Mario Cuomo and Ted Turner. After the conference you came up to me and introduced yourself and we’ve been good friends ever since. JR: I would have to say 1990. LS: You attended many of our ASA Hall of Fame Dinners. Tell us about some of the memories you have. JR: I remember your dinners were outstanding. 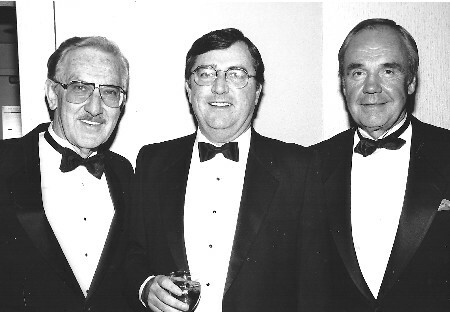 The best dinners I ever went to, including the dinners we had at the New York State Broadcasters. Every time I turned around there was another star. One time I had left the dinner early and went up to your suite in the hotel and way in the back of the room there was this gentlemen sitting down. I went up to him and introduced myself and asked him his name. He said, “Westmoreland.” I said, “What’s you first name?’ He said, “General.” We sat and talked for about a half hour after that. He was a delightful guy. LS: Yes. They were fun dinners. Tell us about your encounter with Joe DiMaggio, who received the Sports Legend Award at our dinner in 1998. JR: I walked into the men’s room and standing at one of the stalls was Joe DiMaggio. I stood about three stalls away because I didn’t want to get too close. In walks Dr. Henry Kissinger with his bodyguard who proceeds to seal off the bathroom. I’m the only one in there with Dr. Kissinger and Joe DiMaggio. Dr. Kissinger is two stalls to my left and DiMaggio is two stalls to my right and they start having a conversation with me in the middle. That was the most unbelievable thing that ever happened to me. LS: Tell me about you new venture. JR: I’m President of the Empire Broadcasting Corporation. We have five stations. We carry Bloomberg Radio on three of them, we play the Big Bands on the fourth and the fifth one is a younger sounding station with an emphasis on Saratoga. LS: What areas do they cover? JR: We cover the tri-city area of Albany, Schenectady and Troy as well as Saratoga. LS: You have your own morning program I understand. JR: I do a Big Bands show, "Reilly on the Radio," from 10am - noon, Monday - Friday. It's 900 AM up here or you can also listen to it on WABYalbany.com. LS: Joe, we have been friends for nearly 30 years and during that time I have never heard a negative remark about you. You are one of a kind and I look forward to another 30 years of friendship.